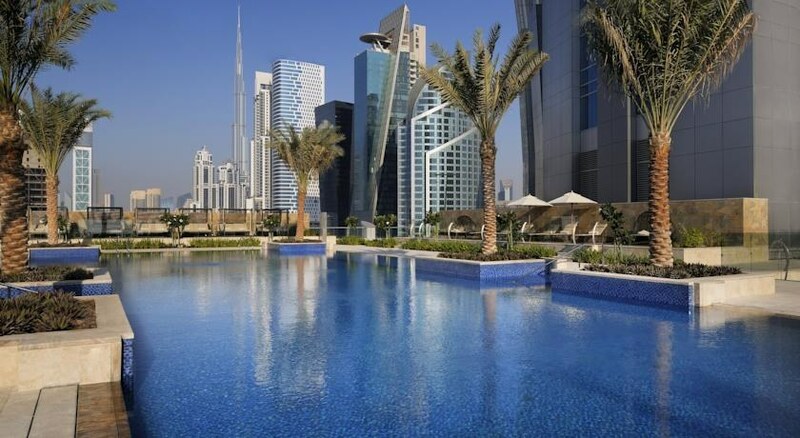 You're sure to be spoiled when you stay in the 5-star luxury of JW Marriott Marquis Dubai. At 355 metres high, it's the second tallest hotel in the world. Situated in Business Bay on Sheikh Zayed Road between two iconic towers, the hotel offers its guests an opulent stay close to the city action. The rooms at this hotel feature a marble bathroom, plush bedding and contemporary technology. 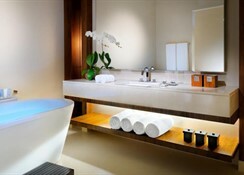 Most of the suites and rooms offer spectacular views of the Dubai skyline, too. Guests can take a relaxing swim in the outdoor swimming pool, get active in the in-house gym or book in for a relaxing massage at Saray Spa and Health Club. The hotel serves delicious local and International cuisine that caters to every taste, with an array of restaurants and bars to indulge in, from Indian to Japanese and Thai-inspired dishes. JW Marriot Marquis Hotel Dubai boasts close proximity to a variety of local attractions, including Dubai Mall, The Walk, Dubai Opera, Dubai Museum, Wild Wadi Waterpark and more. JW Marriott Marquis Dubai is centrally situated in the city, making it convenient to explore the Dubai World Trade Centre, Dubai Mall, Dubai Opera and many more attractions and places of interest. The Burj Khalifa - crowned as the tallest building in the world - is just 2.6km from the hotel. As the hotel is situated in the heart of the city, guests can enjoy spectacular views from their room windows. 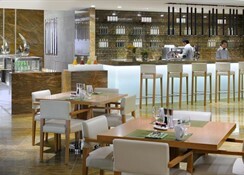 The Dubai International Airport is about 19km from the hotel. All 1608 rooms in this magnificent hotel are beautifully designed and come equipped with quality amenities to ensure a comfortable stay. 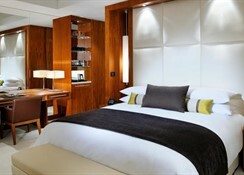 The rooms are categorised as Guest Room, Sea View, Deluxe Corner Suite and Executive lounge access. All the rooms have air-conditioning, luxury toiletries, mirrors, marble bathrooms, ergonomic chair, spacious desk, room service and more. The hotel offers an abundance of cuisines inspired from all corners of the world, so there will be something for every guest. Kitchen 6 serves up International cuisine including Japanese and Middle Eastern flavours, it also exhibits a vibrant open kitchen. You can hit this lively restaurant for breakfast, lunch and dinner. If you want to experience the freshest cuts of meat and a menu of fantastic side dishes then head over to the Prime 68, however, this restaurant requires reservations in advance. Guests also have Tong Thai, Positano, Garden, Izakaya, Bridgewater Tavern, The Lounge, Vault, Rang Mahal and French La Farine and Aqua Poolside Grill and Bar respectively. This grand hotel offers plenty of sports and leisure facilities that will keep you occupied throughout the day. There is a temperature-controlled outdoor swimming pool, where you can soak up the sun and have a relaxing swim. There are sun loungers dotted across the pool, where you can relax and have refreshing drinks. You can stay in shape on your holiday by utilizing the state-of-the-art gym available in the hotel or head to the spa to relax, rejuvenate and unwind yourself. Children too can have fun in the children’s pool under the supervision of the hotel’s staff members.